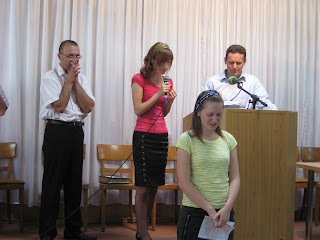 One of the girls on our team is from Transnistria, the breakaway region of Moldova. Olea came to our team speaking only Russian but in a short time has become much more fluent in Romanian than I am after 4 years here! This young woman feels a call in her heart to missions and this summer is travelling with three other girls to Central Asia for a short term mission. I had the privilege of going with her and our Field Leader to her church on the Sunday when she reported to them and they prayed for her as she headed out on this mission. 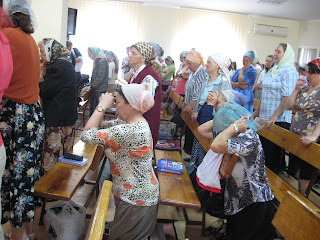 When Moldovans pray, there is nothing half-hearted about it. Posted by Barb at 11:24 a.m.